Citrus season is upon us. This can be confusing for people who live in areas where citrus is never local, which includes most of the United States. Citrus trees bear fruit over the winter months here in the US; hence, I try to keep my citrus consumption within the months of November to March. You’ll find the most variety in stores (and for some of us—CA, TX, FL and AZ—even local options) during these times. Obviously, it’s not always possible to stay seasonal with citrus since we always seem to need lemons and limes. The key here is to just be aware and do your best. The obvious canner’s response to citrus overload is marmalade. Not everyone likes marmalade (though it does make for fine marinades and additions to savory dishes). My J wasn’t really a marmalade fan until I put this one in front of her. She proceeded to eat every last bit of this marmalade over the past month. I didn’t even get a dollop out of the last jar. I guess I’ll be making another batch of this before the season’s over. Super-special lemons cured and preserved in kosher salt. Easy breezy recipe found in Eugenia Bone’s seminal book, Well-Preserved. For other Meyer inspiration, don’t miss Bunkycooks gorgeous post on how they used up their box of Meyers! It’ll be ready for drinking in 4 days! I used Shae’s recipe in her lovely ebook. I like how she describes the process, even how to slice lemons thinly enough to avoid ending up spreading hunkin’ chunks of rind (even if it’s the lush Meyer rind) on your scones or toast. Eugenia Bone also posted a lovely story and recipe for this tender, sweet (not-at-all-bitter) marm on her blog last year, plus there’s a recipe for Meyer lemon granita there too! 5. Orange pectin, which I used in the following jelly recipe. 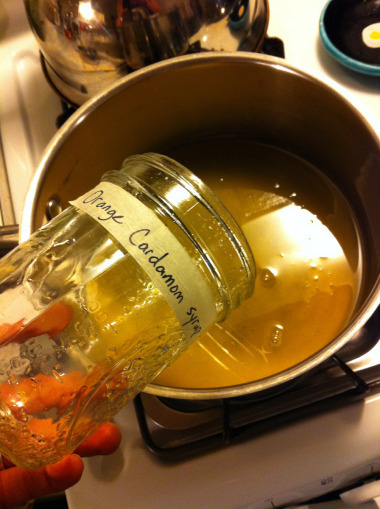 Linda Ziedrich tells us how to make orange pectin in her book, linked in the recipe below. To honor Linda (and save space and time here), I ask that you buy, borrow from a friend, or check out Linda’s book from the library. The recipe is not hard; it just requires 6 oranges, some lemon juice, a blender or food processor and waiting for it to sit overnight. I halved the recipe and accidentally added the not-halved amount of water in the second step. I don’t know whether the jelly will be jelly or syrup yet, but regardless, it is mighty delicious. I love this recipe because it’s super small, and if you use short, quarter-pint jars you don’t have to use a big canner pot. I used a regular-sized stockpot with a 9” cake rack on the bottom. Start your canner pot. Place your jars and rings in the pot and bring it to a boil while you prepare your jelly. Halve and juice 4 Valencia oranges; this should yield about 1 cup orange juice. At this point I added two dried (read: already used/scraped) vanilla beans. These were first used in making vanilla ice cream and vanilla bean marshmallows. (Spent vanilla beans are great to keep to flavor other dishes, sugar, alcohol, lots of other things.) This provided just the vanilla hint I was after, and still plenty of the vanilla seeds for visuals in the jelly. If you don’t have a vanilla bean (dried or not) try adding 1/2 tsp vanilla extract after your jelly is completely cooked, before you ladle it into jars. Don’t stir it up or you might affect the set; it’ll distribute as you ladle into jars. Put pot and its contents over medium heat until your sugar dissolves. Raise heat to med-high and cook jelly until it reaches 220 degrees F. This will probably take about 10-12 minutes. Do skim the foam, gently with a broad metal spoon so you end up with a clear-ish jelly. Stir with a heat-proof spatula only periodically so you don’t lower the temp of your jelly (thus preventing it from reaching a set). I use a $14 thermometer on jelly because the spoon test and I don’t mesh. When you’re testing your jelly with your preferred set test (thermometer, spoon, frozen plate, etc.) just remove it from the heat so you don’t accidentally overcook it. Pull your jars out of the boiling water, ladle hot jelly into hot jars without stirring/disturbing the jelly too much (if that’s even possible). Wipe rims and add two-part lids; place in boiling waterbath for 10 minutes. Don’t touch the jars for at least 3 days! Homemade pectin can take a while (up to a week) to reach a set, so the less you fidget with your jars the better your chances for a set. I don’t really care if this jelly doesn’t work out because it might be the most delicious syrup I’ve ever had. Addie brought me and Megan each a jar of this for hosting the Austin food swap in December. I used it over pancakes and in a batch of nearly-successful citrus marshmallows. She wrote about simple syrups in her Austin American Statesman blog, Relish Austin, but to make this batch she used a tablespoon of cardamom and sliced up peels from 3 oranges to flavor the syrup. My not-quite-successful citrus marshmallows were too bleedy (not enough sugar), but they made a friggin’ delicious addition to fudge sauce. Not that different from the Meyer limoncello recipe, you just make the sugar syrup in the beginning and add all the ingredients at once. Let it sit for a month and then make the best margaritas you’ve ever had. Cathy has a recipe up that I’ll try with my next batch of oranges. I had one of Cathy’s margs last year when I visited. SOLD! Recipe as promised from my post earlier this week on making your own buttermilk. Then add 1 tsp vanilla extract to the wet ingredients. Add your wet ingredients to your dry ingredients and don’t over-mix (or you’ll spend your baking soda’s puffing power too early). It’ll be a little lumpy. Dollop batter into greased muffin tin or into prepared paper cups. Bake for 10-14 min, rotating the pan midway through, until a toothpick comes out clean. I couldn’t let Meyers’ season pass without an attempt at Meyer lemon ice cream. I’m trying a new-to-me method for this. I’ll let you know how it turns out after I churn it up. Secret giveaway: You made it all the way through this post and didn’t fall asleep or leave your computer desk in a rush to hoard citrus. I want to send you a quarter-pint jar of my Meyer lemon marmalade. US & Canadian residents only please (I can’t afford intercontinental shipping, sorry). All you have to do to enter is: leave a comment on this post by Thurs, Feb 3rd telling me what you’re doing with your citrus this season. And if you don’t leave me your email address in the little box that asks you for it, I won’t be able to let you know you’ve won. Congrats to Wendy aka Bladerunner from Portland OR on winning the little jar of Meyer love. She has cool blog on recycling, you can check it out here. Her latest post shares info on ways to de-consumerize Valentines day=suh-weet. Thanks for all the citrus-inspiring comments. Keep up the good work!